A busy time lies ahead for the American boat builder Burger Boat Company, that has received numerous commissions from wealthy boat owners around the world since it announced its intention to launch into the superyacht sector between 115 and 180 feet in strict compliance with MCA regulations. In 2006, Burger Boat Company will launch the 144' three bridge "Mirgab V", whose debut is expected at the next Monaco Yacht Show, and the largest motor yacht in the history of the boatyard, the 154'"Time for Us", that will be presented at the Ft. Lauderdale Boat Show 2006. In 2007, the American shipyard will launch other interesting new arrivals. Firstly "Sycara", the 143' Fantail Cruiser inspired by 1920's yachts, followed by two identical 127' triple bridge yachts, "Areti I" and "Areti II", and by the 140' "Sea Owl". 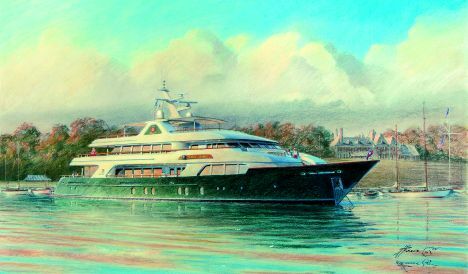 The latter is a motor yacht spread across three bridges and commissioned by a family from Long Island, New York, mainly for their world cruises. As a result, the team that developed the exterior and interior design made up of men from the shipyard's interiors department and members of Andrew Winch Designs, wanted to create a warm atmosphere, with a traditional touch but which would still meet with a contemporary lifestyle. "Sea Owl", due to be launched in the Spring of 2007, will be built in Alustar, robust alloy and resistant to corrosion caused by atmospheric agents, and will use sophisticated, high tech. equipment, including "zero-speed" stabiliser fins and an inert gas-sprinkler mix fire extinguishing system. At stern, the designers have also included a spacious garage with inhabitable platform that converts into a beach, holding a Castoldi Jet 15'tender and other "toys" for the owner and his guests. For further information: Burger Boat Company; 1811 Spring St.; Manitowoc; WI 54220; tel. 920 684 1600; fax 920 684 6555; web site www.burgerboat.com. Exterior Design: Andrew Winch Designs/Burger Design Team.